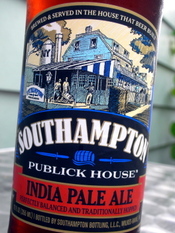 One of the highlights of our lunch at Love Lane Kitchen on Saturday was my first look at Southampton Publick House's new packaging, or at least a look at the new IPA label. Spencer, one of the assistant brewers at SPH tipped me off a while ago that a change was coming, including new packaging and also the renaming of at least one beer, the beer formerly known as Secret Ale (which is now named for its style, Altbier). I like the new labels quite a bit. I think they are an upgrade over the old ones. What about the beer inside the bottle? I really like SPH's beers and this IPA does a nice job of straddling the line between Old World, true IPA character and West Coast, over-the-top-hops style brews. As an admitted hop head, I could drink this one all day. In case you haven't given it a listen, head over to our very own Donavan Hall's beer podcast, Radio Beer Hall. I'm not always good about listening, in fact I usually forget for weeks and then have to catch up, but his latest podcast focuses on a topic that is near and dear to my heart -- drinking local. Always a thoughtful, insightful guy, Donavan talks about about the dangers industrial beer, capitalism in the beer world and, of course, why you should drink local. I'm also enjoying hearing about his Wit project, where he's making numerous small batches of Wit ales in the hopes of perfecting the recipe this summer. Anyway, give it a listen. If you're into beer at all, it's a fun listen. 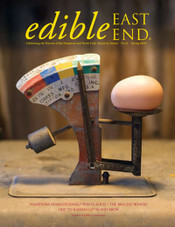 Edible East End is probably my favorite local print publication. Each of its five issues each year are packed with great stories and information for lovers of all things local on Long Island. Unfortunately, my column "East End Oenophile" is no more, but fear not, I'll be writing feature stories for them instead, which is much more interesting anyway. For this month's issue, my lone contribution is some tasting notes from a visit to Bluepoint Brewery's tap room, which run along side a nice piece by James Held. This issue also welcomes Channing Daughters Winery's winemaker Chris Tracy as a regular contributor with his "Winemaker Wonderings" column. 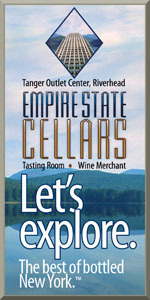 Other wine-related pieces include a one-pager on Corey Creek Vineyards' 2007 Gewürztraminer (always a LENNDEVOURS favorite) and an interesting feature article on Pindar Vineyards/Duck Walk Vineyards. It really speaks to some of the history behind Long Island's largest producer. I also think that it might allude to some of the coverage I've given the winery in recent years, but that could just be my ego talking. You can pick up a copy of EEE most anywhere out east, or visit their still-improving website. 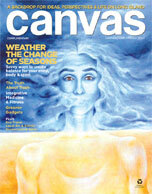 The March 2008 issue of canvas has been published, including my 250-word profile of Paul Dlugokencky, owner/brewer at Blind Bat Brewery in Centerport, NY. As you'll see in the profile, Paul will be opening (once he gets his state license) what very well may be the smallest commercial brewery in the country. He's calling it a nanobrewery because he will start making only one barrel per week. I was lucky enough to meet Paul and his wife, Regina, at the LENNDEVOURS/canvas drink local event Saturday night. We spent quite a bit of time talking about the joys of state licensing, growing figs on Long Island and various other beer/wine/food endeavors. This picture (courtesy of Alex Wolff) shows Matt O'Grady, associate publisher of canvas on the left with Long Island's newest taste-making power couple. If you look not-so-closely, that's me drinking wine over Matt's right shoulder. So why are they a taste-making power couple? Well, Regina is changing careers this year, moving from her job as a librarian to become an organic farmer at Sophia Garden in Amityville, NY. Locally made beer and organic, local food. Worth keeping an eye on I think. This Friday night, I'm hoping to attend the third cask night at Deks in Rocky Point, NY. Our beer columnist, Donavan and Dean from Deks hav secured a pin of Smuttynose Shoals Pale Ale this time around. The cask will be tapped around 6 p.m. and should pour most of the night (until we run out). Last time there were still a couple of pints left at midnight. For all you beer geeks out there, Donavan has provided some information about the brew for us from the brewery. A little over a month ago I told you about the first "Firkin Friday" at Deks in Rocky Point. We had a good turn out of local beer enthusiasts to sample a Long Island-brewed, cask-conditioned ale. I snapped this pic of my brewing colleague, Mike, taking the first sip of the first pint of Blue Point Oatmeal Stout at our first Cask Night. That's the back end of the firkin on the right. Dean and Kevin (the owners of Deks) are going to host another Firkin Friday on the 9th of November. Mark your calendar. It's on the Long Island Beer Calendar already. Keep you eye on my new beer-focused blog, The Beer Hall, because I'll be telling you what the cask is when we finally secure a supplier. I wish I could tell you now, but we want to get you a really, really fresh cask. It's important to get a good turn out for these events since pub landlords are only going to order casks if it is lucrative for them to do so. We can help foster a rich beer culture here on Long Island by supporting such efforts as bringing real ale out this far on the Island. If you aren't so sure why cask conditioned ale is any different or more special than regular tap (or bottled) beer, then check out my guide to "Real Ale." Hope to see you there! Editor's note: I'm planning to attend this event as well, so if you (for whatever reason) want to have a beer together, join us. I'm soloing it again, but Rich will definitely be back on the show soon. On this installment I pop open a Blue Point Hoptical Illusion. It's a fairly hoppy IPA. 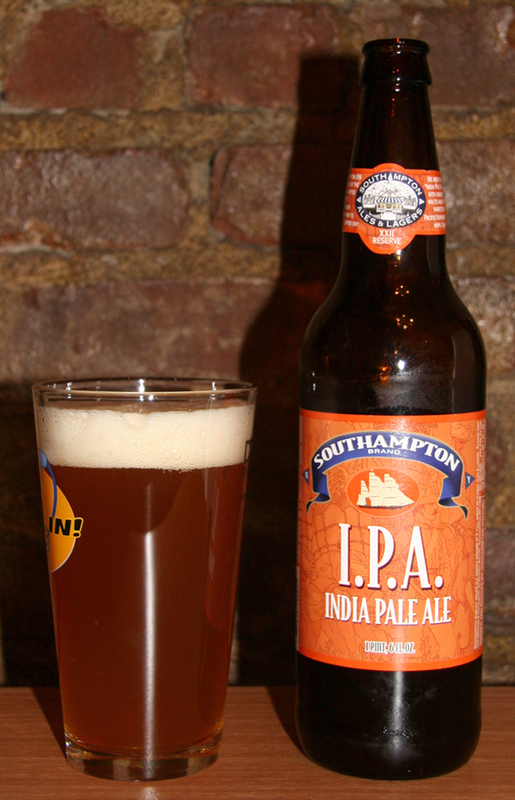 IPA stands for India Pale Ale. It's a style of beer invented in England, but has been adopted by Americans and turned into a completely new beer. The English version was a Pale Ale that was more alcoholic and more highly hopped. The hops act as a preservative to keep the beer fresher tasting over the long voyage from England to India (hence the name). The American version (I should say versions since there's a West Coast style that is even hoppier than the standard American IPA) is hoppier and makes use of American hops. The West Coast variety has a marked citrus character from the Pacific Northwest-grown hops. I tried an experiment and poured the Hoptical Illusion right down the center of the glass to form an enormous head. (I used an oversized glass to avoid spillage.) The idea was to release the aroma and the carbon dioxide. Why? Well, I wanted a flatter beer. The citrus-like bitterness of the IPA is already tongue scrubbing enough without the bubbliness from the carbonation. For the philosophically inclined I decided to play a segment about the philosophy of taste and of flavor perception. Then I finish up the show with an on the spot recording at a pretty cool beer bar I visited while in Houston, Texas. I'll be back next week with another surprise episode. On today's show... it's The Session, hosted this month by Gastronomic Fight Club. You all are familiar with "Wine Blogging Wednesday", well, the beer bloggers of the world decided that if the grape people had their coordinated blogging events that we malty types should have one too: enter The Session. The Session is the brain child of beer writer Stan Hieronymus, author of Brew Like a Monk (which I've written about on The Spirit World). The first Session was in March and there's been one on the first Friday of the month ever since. Today is The Session #4. The subject for today's Session is local brews and I devote the first part of the show to participating in that blogging event. My original plan was to take the microphone to John Harvard's and talk freely while doing a sampler, but real life often gets in the way of my plans. The rules were to pick the brewery or brewpub closest to your house. Well, for me, that would be John Harvard's. In the end I had to pick the brewery or brewpub that actually had beer in my house. This week it's another Southampton brew, their 10th Anniversary Old Ale. I round out the first half of the show with a report on some Long Island Beer destinations: the Brickhouse, Doc Finley's Publick House, and Canterbury Ales. 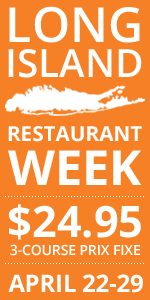 And, of course, I do the Long Island Beer Calendar. In the second half of the show, Rich joins me for a chat about the recent Spring Craft Beer Festival held at the Nassau County Colosseum. Rich put the attendance for his session at about 250. Another person emailed me a brief report about the festival and said they figured there was about a thousand at the evening session. Both agreed that the Nassau County Colosseum was a sad place for a beer fest. Next week... I take the family to Legends in New Suffolk. On today's show you'll get a quick update about what's happening in Long Island's beer scene. Check the calendar often if you don't want to miss a beer event. 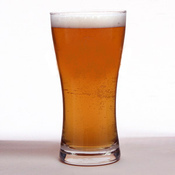 Featured Beer: Our featured beer is the Southampton May Bock. We taste that and give you our impressions. Beer/Food Pairing: Then, Rich and I talk about the beer dinner at Deks in Rocky Point. The story behind this beer dinner is this: Together with podcast regular, Mike, I encouraged the owners of Deks to stage a beer dinner. Beer dinners are something that I know a lot about. My wife Denise (another regular on the podcast, remember the food and beer pairing segments we've been doing?) and I have been hosting beer dinners at our home for many years. 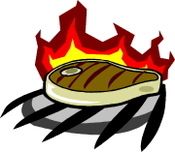 They are so popular that we realized we needed to move these events to a bigger place than our living room and actually get some help with the food preparation. So I explained to Dean and Kevin at Deks just what I had in mind and they said, "Let's do it." You'll hear all about the dinner on the show, but I'll give you a short preview. We had five beers and five courses. Dean and Kevin came up with the menu, then Mike and I suggested the beer pairings. With the scallops wrapped with bacon we paired Allagash White. Next we paired the cheese quesadillas with Chimay Cing Cent. For the salmon wrapped in phyllo dough we had Flying Dog's Old Scratch. We paired Einbecker Mai-Urbock with pickled shrimp with a Thai sauce glaze. We finished the evening with chocolate mousse on espresso infused lady fingers paired with Samuel Smith's Imperial Stout (easily the best combination of the evening). If you haven't been to Deks in a while, you might want to stop in and check out their new twelve tap system and expanded craft beer selection in the bottle. Mike and I have been giving suggestions to Dean about what to make available to Long Island beer lovers. Stop in some time and ask "What's new?" If you want to find out more about beer on Long Island, visit my web site and check out the Long Island section. Also, if you like drinking good beer and want to learn more, join our Long Island Malt Enthusiast group. Next week... We'll have recap of the Spring Craft Beer Fest. And we'll do a tasting of beers from one of Long Island's breweries. Rich Thatcher and I are back again this week with another installment of our Long Island beer podcast. As always we have Long Island beer news and a run down of all the upcoming events listed on the Long Island Beer Calendar. You'll get my report on the Southampton Beer Dinner last week and an update about what's available at John Harvard's in Lake Grove. 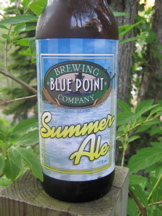 Rich joins me to talk about today's featured beer, Blue Point's Summer Ale. It's one of those refreshing beach beers. We round out the show with a trip to Barcade in Brooklyn where we play Asteroids while drinking beer. Next week we'll take you to the Blind Tiger in Manhattan and we'll be tasting more Long Island brews. On today's show... I'm joined by my co-host Rich Thatcher. We'll be taking you to Spuyten Duyvil, a cool beer bar in Brooklyn. 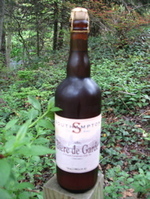 Our featured beer of the day is Southampton's BiÃ¨re de Garde. I was hoping to get some coverage of last night beer dinner out at Southampton Publick House, but I didn't get back from the dinner until after midnight. Needless to say I had a good time. I'll tell you all about it soon. Southampton is putting on their beer dinner again, but this time in Huntington at Canterbury Ales. This event will be on the 21st and you can find the details on the Long Island Beer Calendar or on my blog. Taste a line-up of 5 beers paired with 5 appetizers. Price per person is $30. I'll be on hand to talk about the beers. The chefs at Deks are putting together a special menu. I'll let you know what the menu is when I find out. We finish up the show with a beer blend, a high gravity "three threads" using all Weyerbacher ales. Coming soon to the show: The Session #4 on June 1st will be a "Local Brews Event" hosted by Gastronomic Fight Club. We'll be participating by picking a local brewpub and doing a whole show devoted to their beer. Leave a comment and let me know which of Long Island's breweries you like best. Maybe I'll make the featured brewer "the people's choice." Next week... We'll take you to Barcade where we drink beer and play Asteroids. I turned 32 last Thursday, so I took the day off to spend it with Nena and Jackson. We rarely make it out to the Hamptons, particularly once the 'on season' starts, so I thought it would be fun to head out to the Hamptons, enjoy the beautiful day and maybe have a tasty lunch somewhere. As we drove out, I didn't have any particular restaurant in mind, but then we drove by Southampton Publick House, a place that I've wanted to try for a long time now. I've been a fan of their beer for quite a while and I'd heard some good things about the restaurant too. And, because it was my birthday, my loving wife (who avoids beer almost at all costs) suggested we go. We were there for lunch, and it was only our first time there, but at this point I'd still suggest that you go there for the beer, not the food. Positive: I really love the beers. I had a Secret Ale (their flagship beer) and a Golden Lager. I also sampled their Double White after Nena tried it. If you haven't tried the beers, track them down and try them. Negative: I ordered a blackened duck salad, because it sounded good and was one of the few non-standard pub fare items on the menu. The duck came out cooked very (very) well done, rendering it tough and barely recognizable as duck. It was a simple salad of lettuce, duck, tomatoes, green apple and goat cheese. With the duck overcooked, and the tomatoes flavorless, there wasn't much saving this salad. They should have at least tossed all of the ingredients together so the dressing covered the apple slices, which were slightly browned. Positive: The place is very baby friendly. The restaurant was pretty empty because it was a Thursday and it's not Hamptons season yet, so we had a back dining area pretty much to ourselves. Then again, Jackson didn't wake up until we were leaving. Negative: Nena ordered mussels steamed in beer with andouille sausage. She thought there was too much sausage and that it completely overpowered the mussels. Positive: Did I mention the beer? Seriously though, our server was great and so was the hostess. Good service can make a meal like this one bearable. Of course, so can good beer. We'll go back some time. Hopefully the kitchen's "A team" is cooking next time...I can only assume they weren't on this visit. I hope you all enjoyed the last installment of the Long Island beer and malt podcast, The Daily Catch. This week I'm joined by Rich Thatcher, fellow beer and whiskey enthusiast and contributor to Catch & Release (my blog) where he writes about whiskey and Long Island restaurants. Rich and I talk with Dudley Cates, the man behind Crop Circle Ale. We caught up with Dudley out in front of Shoreline Beverage in Huntington. It's not just a cool name for a beer, it's brewed with malted barely from the fields in England where the crop circles appear each year. Dudley says there are still crop circles appearing in the fields and the first one of the season is due soon. After that, we take you on a trip to Mugs Ale House in Brooklyn and our recurring guest Mike tells us about his JW Lees 1988. I then finish the show by telling you about my latest beer cocktail concoction: the Long Island Sunrise. Next week... We take you on a trip to Sixpoint Craft Ales in Brooklyn and taste some of their new wheat beer. A little more than two years ago, I started exploring the world of podcasts. I forget the details, but I know Lenn planted the seed for the idea of doing a beer podcast. He sent me a link to a wine podcast and I started listening. Being a beer enthusiast I started searching for beer related podcasts. I found a few and started listening. It wasn't long before I plugged a microphone into my laptop and started doing my own podcast. The Brewer's Kitchen focuses on beer and food pairing. The Cottage Brewer covers the culture of brewing beer at home. Mixing It Up gives you some suggestions for mixing up beer cocktails. 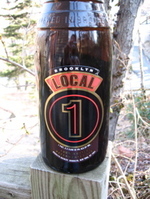 On today's show, the featured beer this week is Brooklyn Brewery's Local 1. I tell you about the upcoming beer dinner at Southampton Publick House (May 10). There's another installment of the Brewer's Kitchen: paring Tapas and ice cream with an Imperial Porter. I'll be taking you to the Brooklyn Brewery tasting room to experience that scene. And, we'll round out the show with some beer mixology: how to make a Strawberry/Banana beer cocktail with Blue Point Toasted Lager. Use the links below to listen or subscribe to the RSS feed. Long Island Pumpkin Ales -- Too Much About the Spice? Over the last week or so, the weather on Long Island turned cool. A few of the trees in my yard took this as a signal to start dropping their leaves -- my yard is littered with auburn, brown, garnet and orange. The signs of Fall are everywhere. Last weekend, I took my family to the Garlic Festival (see Denise's article on Growers and Grocers), the second in what might prove to be an annual event. In addition to last weekend being a celebration of garlic (I was seriously tempted to brew a garlic beer -- maybe next year), that same weekend was the beginning of pumpkin season. On Long Island "pumpkin season" means climbing into your car and creating an artificial traffic jam on Route 48 (the artery that feeds Long Island Farm and Wine Country). Every farmstand along Route 48 has an expansive pumpkin patch and the road is dotted with sign urging people to "pick your own." It's also the time of year when Long Island's brewpubs unleash their pumpkin ales on a thirsty public. Both the Brickhouse and John Harvard's have their pumpkin ales on tap right now. I'll admit that I'm not a fan of pumpkin ale in general. I've only tasted one pumpkin ale I really liked and that was a craftbrew (homebrew) made by my friend Wayne Wambles when we were both living in Tallahassee. My big complaint about the Brickhouse pumpkin is that it's emphasis is on the pumpkin spice, not the pumpkin flavor. Also, a pumpkin ale should have a thick mouthfeel. It should not be a pumpkin spice flavored pale ale. Brewers, when you make a pumpkin ale, think about making something as thick as a stout, but something that's a bright orange instead. A good pumpkin ale would be ideal served in the cask. It should taste of pumpkins, not flowers. I don't think any Long Island brewer is likely to listen to me since few people are inclined to mess with success -- and pumpkin ale is a success. 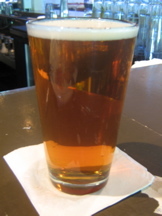 At John Harvard's I talked with headbrewer David Deturris about his pumpkin ale. "It outsells by volume all other beers we brew here. Even the beers we brew all year. I'll brew more pumpkin ale from September to December than I brew of the John Harvard's Pale ale in twelve months," he told me. I asked him if he thought that pumpkin ale's success was due to the "gimmick factor." Pumpkin ale (at John Harvard's and the Brickhouse) are served with a cinnamon sugar rim (think about the salt rim on a margarita and you know what I'm talking about). So that first taste of pumpkin ale delivers a mouthful of cinnamon and sugar which masks the flavor of the beer and moderates the spicy/floral nature of most pumpkin ales. Also, the aroma is dominated by that sugary cinnamon layer on the rim. My guess is that you could put cinnamon sugar on the rim of a Pabst Blue Ribbon and it would taste like pumpkin ale. David agreed. People like the cinnamon sugar gimmick. David also gave me a taste of the "raw" pumpkin ale before it is spiced. It's a standard amber ale with nothing assertive in the brew at all. Everything happens in the serving tank. That's where the spices are added. It's a mix of the standard spices your mother tosses into her pumpkin pie: brown sugar, allspice, cinnamon, nutmeg, etc. The only thing missing from these beers is actual pumpkin. A few breweries advertise that they add pumpkin to the mash, but it's typically a homeopathic dose of pumpkin filling just so they can say there is real pumpkin in the brew. Another reason these beers are so successful is that they are only around for (at most) three months. It's a novelty -- a marker of the season. When you notice the air getting a little nippy and the leaves starting to fall and pumpkin patches opening, it's hard to resist ordering a pumpkin ale. Enjoy! I absolutely love cooking with fire and this weekend, Nena and I are hosting what will probably be our biggest party of the summer. It's only 13 people, but with all that we have going on these days, it seems pretty big anyway. Now, I don't plan dinner parties that are anywhere near as ellaborate as the Obsessed One, but I do try to introduce our sometimes culinarily-challenged friends to some new things every time out (while keeping some old standards around as well). So, I do a fair amount of menu planning ahead of time -- and one certainly has to when one of the centerpieces of the meal will require 12-14 hours to cook. So as I started to let the menu bang around in my head, beginning with appetizers, I knew that I had to make my famous-in-my-own-circle grilled wings. Oddly enough, I don't think I've made them with the same sauce twice (and I've made them at least 20 times in the past couple years). I'm also going to experiment a little with some grilled tacos filled with mashed potatoes and Manchego cheese. I seem to vaguely remember reading about something like this somewhere, but I can't find the recipe anywhere at home. So, I'll be branching out on my own -- which is normal. I often draw inspiration from cookbooks, but rarely follow recipes. I'll be rounding out the appetizers with grilled pizza of some sort -- though I don't know what kind just yet. May be a last-minute, pantry-cleaning pizza. For entrees, I've only made pulled pork once in my smoker, but I I want to work towards perfecting it. So that is a must for this gathering. The first time around, I used rub/technique advice from WhiteTrashBBQ, but this time I think I'm going to change a few things up. Okay, I'm going to change everything up just to see how it turns out. Unfortunately we have a few attendees who don't eat pork (I know...it's crazy). For them, I'll be making some sort of burgers. The sides will be pretty traditional for BBQ. Nena is making macaroni and cheese, I'm going to grill some corn on the cob. But, Nena is also making this tasty broc-walnut salad we had at her parents' house once. Dessert -- that's in Nena's more-than-capable hands. For a change, I might actually take pictures of the preparation and the party itself. No promises though. Once the local beers and wines start flowing...I'm easily distracted. When I moved to Long Island in 2002 I didn't know anything about the local beer culture. I didn't even know where I could find a decent beer store. Fortunately, the corner grocery in my new neighborhood had six packs of something called Toasted Lager from Blue Point Brewing Company. So after unloading my moving truck I was able to quench my thirst with that caramel colored, roasty brew. That was a little more than three years ago. There was a time when in most restaurants on Long Island, if you said you wanted a Blue Point, you'd would get a pint of Toasted Lager. This flagship brew has been the foundation on which a solid house of beers has been built. However, as Blue Point has grown and expanded, they are starting to be known for more than just their Toasted Lager. In fact, their latest release Blueberry Ale is extremely popular with Long Islanders. Taps all over Long Island are now flowing with Blue Point Blueberry Ale. 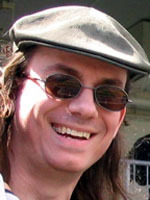 Blue Point Brewing Company got started in 1998 as a partnership between Peter Cotter and Mark Burford. Prior to launching their microbrewery, both were homebrewers and lovers of craft brewed beer. Burford opened a homebrew shop in Franklin Square in the early 1990s. Later, he was brewmaster at Long Island Brewing Company in Jericho, but left that post long before that brewpub was closed by the IRS in 1999.